This photo will remain etched in the memories of Indians for posterity – it is our Prime Minister addressing US Capitol and members giving a standing ovation !! “In every sector of India’s forward march, I see the U.S. as an indispensable partner,” Mr. Modi told the audience. Not only Indian newspapers, but most media across the globe carried pictures of Shri Modiji in Congress on their front pages on Thursday, 9th June 2016. The United States Capitol, often called the Capitol Building or Capitol Hill, is the seat of the United States Congress, the legislative branch of the U.S. federal government. It sits atop Capitol Hill, at the eastern end of the National Mall in Washington, D.C.. The original building was completed in 1800 and was subsequently expanded, particularly with the addition of the massive dome. Shri Narendra Modi is not the first ! – he is the 5th Indian prime minister to address a joint session of US lawmakers (sixth if you include Nehru, who addressed the House and Senate separately in 1949), and from the packed audience it seemed as if they had momentarily put aside the intensely riveting politics around the California primary and the subsequently presumptive nomination of Hillary Clinton as the Democratic candidate, to come and hear Modi in Washington DC. The Prime minister’s trip to the US was certainly about saying farewell to Barack Obama, but equally to tell the bipartisan US Congress that he is willing to deal with whoever becomes the next president of the US, Hillary Clinton or Donald Trump. No wonder he was aiming to please the Congress, especially sections who wonder about his democratic credentials. Modi’s invocation that the “Constitution is his only holy book,” is aimed at reassuring this section of the US political class. In his speech, the PM condemned global terrorism and said during a lengthy address to Congress on Wednesday that growing economic ties benefit both his country and the United States. “The innovation strength of our two countries comes together in California,” said Mr. Modi, who visited California last year. “Here, the innovative genius of America and India’s intellectual creativity are working to shape new industries of the future.” Mr. Modi made clear that he intended the speech to hail a new moment in relations between the United States and India when he told Congress at the outset that he had started his visit to Washington with a trip to Arlington National Cemetery. He called it “the final resting place of many brave soldiers of this great land.” “I honored their courage and sacrifice for the ideals of freedom and democracy,” Mr. Modi added. Way back in March 2000, when US President Bill Clinton finished his address to a joint session of Parliament in New Delhi, and walked down the aisle in Central Hall, a number of MPs cut across party lines from both Houses of Parliament, jumped over benches and jostled for space to somehow shake hands with him. More than what the visiting dignitary spoke about, the honourable parliamentarians’ over-enthusiasm and joy to meet the visiting dignitary — including those who till the other day had never missed an opportunity to deride America and its leadership — made the news. A decade later, in November 2010, when President Barrack Obama was to address a joint session of Parliament, the MPs were especially told to "behave in a dignified manner" during and after his address. The advisory was official, sent by the parliamentary affairs ministry to leaders of all parliamentary parties to ensure that "decorum and dignity" of India's temple of democracy was maintained. 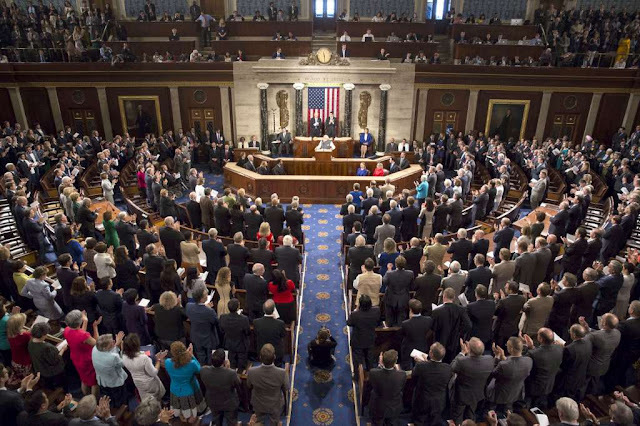 Now rolls reversed ~ when our Prime Minister addressed a joint meeting of Congress, the US politicians jostled around for autograph. It was also the occasion when those sitting in the audience — in the visitors and media gallery in Central Hall of Parliament and those hearing globally — wondered if ever an Indian leader would possess the same oratorical flourish and energy to speak like a world leader at such forums. A few years ago, there was debate on whether Obama had spoken extempore or was making a smart use of a teleprompter to read his speech and make it appear like extempore. On 8th June 2016, the manner in which Modi spoke, the substance and flourish of it, despite the fact that he spoke in a (English) language which for a long time in his life must have been alien to him, and the kind of rapturous applause he received from the US Congressmen, would make every Indian feel happy and confident of oneself and the nation, whether in India or abroad. On Wednesday, Modi accomplished something that a vast majority of Indians had only dreamed about for long. The thunderous applause when he finished, continuing for over a minute from all corners of the hall in the Capitol, was comparable to the one Modi received at BJP's National Council meeting. A clearly overwhelmed Modi kept waving at the audience in all corners, accepting the cheers with gratitude. Mr. Modi has encouraged a continued American military presence in Afghanistan because he is worried that Pakistan will have unchallenged influence there once the Americans leave. “Your contribution in keeping the region safe and secure is deeply appreciated,” Mr. Modi said, adding: “A commitment to rebuild a peaceful and stable and prosperous Afghanistan is our shared objective.” Almost exactly 31 years ago, Rajiv Gandhi, then India’s prime minister, also spoke of Afghanistan in an address to Congress. But he did it in the context of justifying the Soviet military presence there because, he said, Soviet troops were “invited by the Karmal regime,” a reference to the Soviet-installed government of President Babrak Karmal. The different references to Afghanistan are a measure of just how much relations between the world’s largest democracies have changed in three decades. Some of us wondered as to why in this ‘selfie World’ why none took selfies with the Indian dignitary. It is because, US lawmakers and staff aides had been told that when they meet PM Modi during his Washington trip, they should not take any selfies. The advice was issued by House protocol expert Elizabeth Heng. Apart from addressing the joint sitting of the US Congress, PM Modi attended four back to back meetings at the Hill. He also attended a lunch hosted by House Speaker Paul Ryan and a reception hosted in his honour by the Senate and House foreign relations committees and the India Caucuses in the House and the Senate. As he left the Capitol Hill, the Prime Minister broke protocol to reach out to members of the Indian community waiting outside, shaking hands with many of them.